As President and Chief Executive Officer of the Gary and Mary West Health Institute, a San Diego-based, nonprofit applied medical research organization dedicated to enabling successful aging, I write on behalf of California’s low-income individuals living with chronic medical, mental, behavioral, or developmental disabilities who currently face greater challenges in accessing appropriate dental care than healthier people. that we feel could be useful to you as you consider legislative action on healthcare transparency. Thank you for continuing to follow-up on the eye-opening Denti-Cal report issued in April 2016. It was an important start to ensuring equitable dental care access for low-income Californians. Given the agenda of the public hearing on March 22 is focused on a day in the life of the patient and provider, I want to share some of our experiences at the nonprofit Gary and Mary West Senior Dental Center (“Senior Dental Center”) located in downtown San Diego and provide recommendations to strengthen the Denti-Cal program. The Gary and Mary West Health Institute, a nonprofit, nonpartisan applied medical research organization dedicated to enabling successful aging for seniors, appreciates the opportunity to respond to your request for information on the agency’s planned new direction for the Innovation Center and its opportunities to deliver new delivery and payment care models for Medicare beneficiaries. Dedicated to enabling seniors to successfully age in place with access to high-quality, affordable health and support services, West Health, a nonprofit based in San Diego, issued the following statement from its president and CEO, Shelley Lyford, in opposition to the U.S. Senate’s Graham-Cassidy legislation. 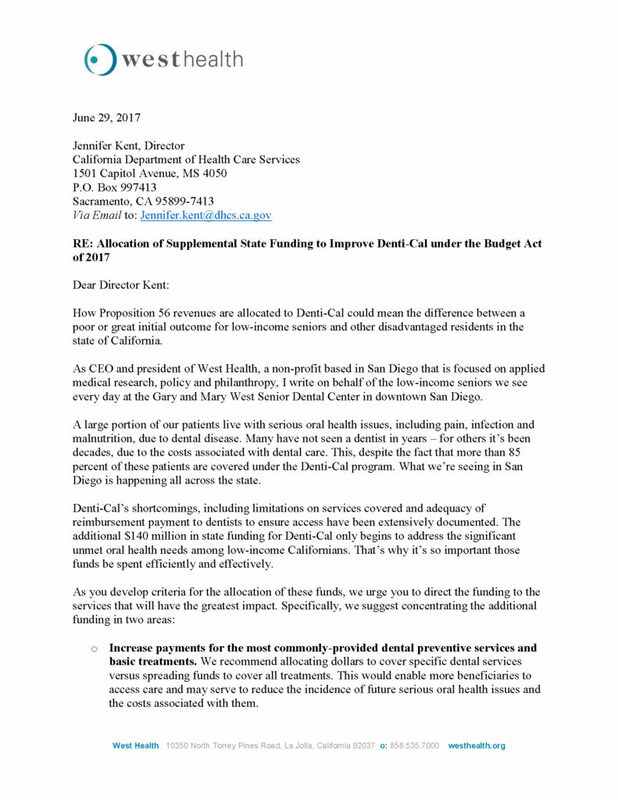 How Proposition 56 revenues are allocated to Denti-Cal could mean the difference between a poor or great initial outcome for low-income seniors and other disadvantaged residents in the state of California. 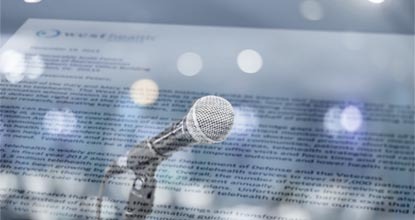 The Gary and Mary West Health Institute, a nonprofit, nonpartisan applied medical research organization dedicated to enabling successful aging for seniors, appreciates the opportunity to provide comment on the Centers for Medicare and Medicaid Services’ (CMS), “FY 2018 Medicare Hospital Inpatient Prospective Payment System (IPPS) and Long Term Acute Care Hospital (LTCH) Prospective Payment System Proposed Rule, and Request for Information (CMS-1677-P).” We support the proposal to adopt malnutrition electronic clinical quality measures (eCQMs) and a potential malnutrition composite measure for future inclusion in the Hospital Inpatient Quality Reporting (IQR) and Medicare and Medicaid Electronic Health Record (EHR) Incentive Programs. As CEO and Dental Director of the nonprofit Gary and Mary West Senior Dental Center in San Diego and Chief Strategy Officer and Executive Vice President of West Health, we are writing to urge you to support the oral healthcare needs of seniors. It is a key reason why California voters passed Prop. 56 last year: to invest new tobacco tax revenues into expanding patient access to essential healthcare services provided by community clinics, dentists and physicians.